For 24 hours on Tuesday the University of Oklahoma hosted Giving Day, a campus wide fundraiser to help our students and programs! Overall the University raised $477,764 through 2,123 gifts. 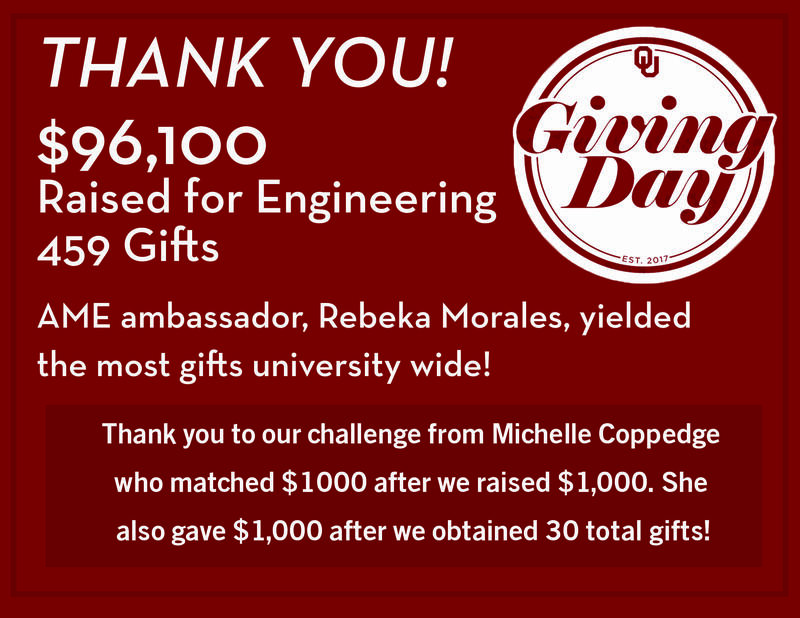 The engineering department raised $96,100 with 459 gifts and AME’s own ambassador, Rebeka Morales yielded the most gifts university wide. AME had an encouraging message from Dr. Saddique to get the donations started and a donation center in the Hitachi Conference room where students could donate between classes. AME would like to thank everyone who donated to support our amazing student teams! They have big goals and with your support that are even closer to reaching them. Thank you to our challenge from Michelle Coppedge who matched $1000 after we raised $1000 and another $1000 after we obtained 30 total gifts.